The Woodland Building houses the Chemistry and Physics departments at The Pennsylvania State University’s Abington Campus. Following a feasibility study, PSU engaged Spillman Farmer to perform major renovations of 21,000 square feet of the building. The Woodland Building houses the Chemistry and Physics departments at The Pennsylvania State University’s Abington Campus. Following a feasibility study, PSU engaged Spillman Farmer to perform major renovations of 21,000 square feet of the building. The renovations included its laboratories and classrooms. Our design for the renovations of Woodland positions the department for future success and growth. Some of the concerns Spillman Farmer addressed in the design were a lack of collaborative spaces, narrow corridors, clear building functions, potential facade renovations and hazardous materials abatement. One of the challenges with this project was the need for the Woodland Building to remain operational during the renovations. Spillman Farmer worked with PSU to design a phasing plan that would avoid disruption of classes. 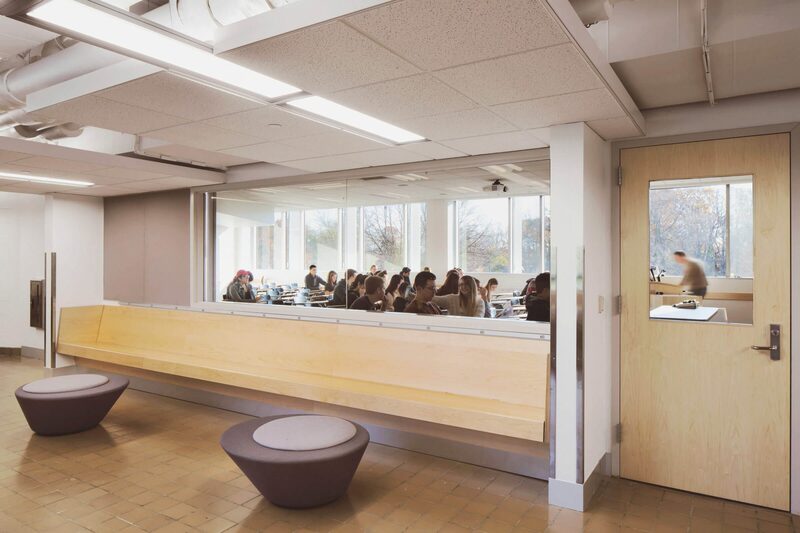 Following the successful completion of Phase I renovations, in 2014, classes moved into the newly renovated portion of the building. The team completed the remainder of the renovations in 2015.